ThemeVale.com – Bigcommerce Themes & Bigcommerce Templates We create Bigcommerce Themes that have it all: Awesome Features, Unique Designs and Powerful Add-ons. Does your website has a large number of products and categories? You think about a real website with a Homepage not only can show all hot products of each categories but also can bring to your customers a clean look? Today, we would like to bring to you our latest Bigcommerce Theme: Flexykart – Stencil Premium Responsive Bigcommerce Template is the best choice for you. Look at the Homepage, each of Block attracts your customers by a nice and neat displaying to easily find the products. Let name some awesome features Flexykart gives you: A tons of powerful theme features on homepage & other pages, such as: Advanced Mega Menu, Product Widgets Slider, Brand Slider, Ajax Dropdown Cart, Social Sharing Buttons, Custom Product Tab, Custom Contact Page, Newsletter Popup, Catalog Category Search, Product Image Swap, Ajax Popup For Login & Registration… and more. 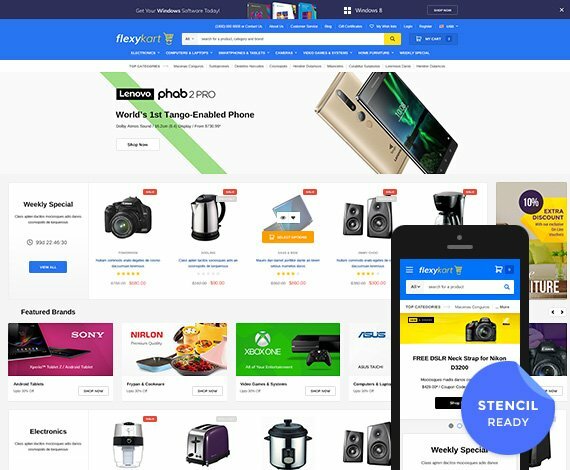 Using Responsive Web Design (RWD) on Bootstrap framework will make your store display perfectly/ exactly with all devices such as: Desktop, iPhone, iPad, Smartphone Android, Tablets Android…This will bring to your customers the best shopping experience, no matter which devices they use, no matter where they are. The most important thing is our Flexykart – Stencil Premium Responsive Bigcommerce Template can match perfectly with all Stores, such as: Electronics, Car Parts, Supermarket, Shoes, Apparel, Furniture, Sporting Goods… It’s time to upgrade a higher standard for your website with Stencil Bigcommerce Template – Flexykart! Create your own style / colors with Bigcommerce Theme Style Editor. Show up awesome on both Mac, Windows, iPad, iPhone, Tablets, Android and Windows Phone. Also, fit your various screens: Design in optimized for all most popular screen resolutions. When screen is resized, design elements are transformed smoothly on each breakpoint (from 320 to 1280 pixels) in order to adapt to the current resolution. Uses CSS 3 / HTML 5 + Bootstrap 3 and Google Web Fonts and Font Awesome Icons. Bigcommerce Add-on: Popup Newsletter - This add-on for all pages is going to make your guests easily sign up for newsletters once they visit the site. Besides, you can also add in different social media icons or whatever you want your customers to pay attention to. Bigcommerce Add-on: Catalog Category Search allows users to search within a category or subcategory, by adding a drop-down list to the quick search bar. As an aid to the user, the active category is automatically selected in the drop-down list. * This add-ons not included in the Standard package. Bigcommerce Add-on: Product Labels - With our new development integrated in the Bigcommerce templates, you can create labels or icons for Sale products easily and user-friendly. Before, the shopping information going through a shopping cart page. With this new development, the shopping cart block only appears when you click the mouse to the cart. Plus your guests can quick view the cart at any page when they want. Bigcommerce Add-on: Custom Product Tabs (only on Product Details Page) - This is a add-on for the Product Detail Page besides the default tabs. You can add whichever HTML content in the new tab and simply to use/ customize/ management. Please note: This price is just for each of Custom Product Tab. Well-designed and informative contents (managed in the back end) help your guests access what they want at the fastest. Bigcommerce Add-on: Product Image Swap - allows your customer to view two different images of your product while browsing your Homepage, Category Page and Product Details Pages. If a product carries multiple images, this add-on will show the 2nd image listing from product thumbnails. When a user hover over any product listed in Homepage, Categories Page, Featured Products, New Products, etc... It will display the second image for that product. Add to Wishlist button available on each product in the homepage, category pages. Replace the boring part of the show contact directory default Bigcommerce. Help your customers find you easily store your information, contribute to increased profits when your customers needs in in-store purchase. Bigcommerce Add-on: Grid / List Toggle is a simple add-on which adds a GRID / LIST toggle button to your product archives allowing users to, toggle between grid / list views of your products on your Bigcommerce store. The LIST view mode arranges products in a vertical list and pulls in the excerpt to give a more detailed overview. Bigcommerce Add-on: Brand Slider – The Brands slider in the homepage/ slidebar in the category pages helps guests quickly access the brand they are searching for. Bigcommerce Add-on: Lazy Loading Images – Is a technique that delays loading of images in long web pages. Images outside of viewport (visible part of web page) won’t be loaded before user scrolls to them. Using Lazy Loading on long web pages containing many large images makes the page load faster. Browser will be in ready state after loading visible images. Bigcommerce Add-on: Product Widgets Slider – Display your Top-Selling Product a scrolling product display. Alternatively, we can also set up any one of the following as a auto populated product scroller in your bigcommerce store: New Products, Top Sellers Products, Featured Products, Popular Products, Recently Viewed Products (only on Product Details Page), Related Products (only on Product Details Page). Google’s Rich Product Snippets for Better SEO: Now Included. JS files are compressed to speed up loading time at best. All our Bigcommerce Templates has been optimized in the best way possible for you to reduce your web page load time. We design themes to entice and encourage customers to purchace at their very first visit. All our Bigcommerce Templates are fully and thoroughly tested: Div / Table-less HTML markup, XHTML 1.0 Strict valid, CSS 2.0 and CSS 3.0 valid. Get the best technical support around! If you have any questions or problems, we're here and happy to help! Please, don't hesitate to contact us. One of our goal is to bring you compatible themes with most of the commonly used browsers which become a business core advantage. Combination of SEO and our web team make a powerful weapon to get super high conversion rate websites. We analyze, and then suppose you the best methods for any necessary processes or features make your website operate stably and smoothly. All our themes come with full layered PSD files, easy to edit and customize. We convert your PSD design into a high quality, hand coded, SEO optimized, cross browser compatible, XHTML / CSS markup ready Bigcommerce theme. You will get a pixel perfect platform theme like PSD. Giving you the nice designs, convenient structures and high business efficiency is the goal of our work. We have a team of professional designers with extensive experience and creativity does not stop. Do you have a project, we can help you with? Why not get started by filling out our inquiry form.